*Note; I wrote this piece days after Cronk had signed with the Sydney Roosters when the emotions were running high and the hurt was still very raw. Suffice to say, I am still devastated, as his self-proclaimed number one fan. I have just been waiting for the right time to publish this emotive outlay which is now – when Cronk faces his former club, coach and team mates for the very first time after a 17-year association at the Melbourne Storm. Everyone has an idol growing up. For some it is their parents. For others, it is an actor or actress. A favourite member of the Beatles, Guns and Roses, the Spice Girls. A beloved superhero from the Marvel or DC Comic Universe (unabashed Superman fan right here). However, those of us who are genetically wired with a vested interest in sport and barrack for a particular sporting team, would have an adored player that they are drawn too for perhaps phenomenal skill, athletic prowess, the quiet achiever, the honest toiler, whatever the reason. That player for me was Cooper Cronk. Not blessed with talent, slept in when they were handing out natural ability, but his unrelenting impetus to work hard to be the best, made me respect the player, the athlete, the person. The 3rd of April 2017 will be a day I will never forget. It was a Monday. The most disliked weekday of the five, with the mindset of, make it to the end of the day and the weekend will be one day closer, where work and other stresses are shelved as one focuses on an outlet to escape reality and delve in the passion and unwavering love of a boy and his favourite sporting team. Except this was no ordinary Monday. As news broke that the Melbourne Storm had shelved a scheduled player media interview at their AAMI Park headquarters, replacing it will an impromptu press conference, speculation across all social media platforms went into overdrive. A player signing? The re-signing of Billy Slater? A coaching extension for Craig Bellamy? New sponsorship deal with long-term partners Crown Resorts? Anything but the above would eventuate at 11.30am press conference. As I peeled my eyes along my twitter feed, one prominent rugby league journo suggested it was a star player quitting the club at seasons end. Suffice to say my anxiety levels were peaking, breaking new unchartered territory, as I feared the worse. Several weeks prior there was a news item published in Sydney’s News Corp press about the likelihood of current rugby league star was about to give the game away for love. For love? Surely this was a gee up. I mean, we are talking about rugby league players here. The stereotypical modern day meat head who only cares about winning a premiership (and loves their monthly pay check). Cooper Cronk, a 14 year veteran of the Victorian based NRL franchise was rumoured to be the player in question. Having been a certified bachelor in bleak city for most of his Storm career, he had found love, falling head over heels with Fox Sports presenter and personality Tara Rushton. The pair had got engaged over the off-season and it was a forgone conclusion that a long distance relationship was not going to be feasible. With Cronk inking a new two-year deal at Melbourne Storm in late 2016 and Rushton firmly established in Sydney and making inroads as a media and sports journalist at Fox Sports, something had to give. And give it did. As journalists and television news crews and cameras piled into the AAMI Park media room, in rolled Coach Craig Bellamy, Chief Executive Officer Dave Donaghy and the Storm No.7, one member of Melbourne and Rugby League’s esteemed ‘Big Three’. All sat emotionless and faced the room of waiting scribes as Donaghy addressed the media, thanking them for attending on such short notice and passed over to Cronk. As I gripped my cup of green tea in utter suspense, a visually emotional Cooper trembled when speaking, informing the press and those tuning in via all sorts of mediums of his heart wrenching decision to quit the Storm at seasons end, ending a 17 year association (having signed with the Storm in 2000 as a 17 year-old) with Melbourne Rugby League club for as he so graciously put it “it’s time I put someone else first”. Forever the selfless individual, which again was seen by all post the Storm’s preliminary win against the Broncos at AAMI Park, where Cronk refused to be chaired off by his team mates, instead sought out other departing players and pushed them forward to be saluted and clapped off by the Melbourne faithful. The mark of the man. My worst fears had been confirmed. My heart sunk. Tears rolled down my face. My favourite player, my hero, my idol and in some regards my role model was leaving Melbourne and quite possibly the game of rugby league or was he? The first of the trio that play in purple was departing the building, reducing the combination to a dynamic duo. The last to make his debut for the Storm would now be the first out the door of AAMI Park. So much for riding off into the sunset together as many had thought would happen in a year or two’s time. Albeit, a blessing in disguise from a transitioning point of view ensuring 1,000 games worth of experience does not leave the joint all at once leaving the club in a pickle. The Melbourne maestro, a manufactured, self taught No.7 who through sheer, persistence, endless hours of repetition and a relentless work ethic that is unparalleled, unmatched, superior to every other NRL player, because it had to be, in order for Cooper Cronk to climb to the highest of heights in rugby league. When the Storm lost regular halfback Matt Orford at the end of 2005, instead of going to market, Craig Bellamy decided to throw Cronk the vacated No.7 jersey telling him “I need you to do two things for me. You need be able to kick and you have to be able to tackle”. Throw in a six-week crash course in ‘halves play 101’ with former Newcastle Knights half turned NRL analyst and commentator Matthew Johns, and ‘presto’ Cronk would occupy the coveted purple No.7 jersey for the next 12 years out of the eventual 14 he would now spend in First Grade at Melbourne, forging a remarkable career at the southern NRL franchise. Cronk is someone who has never rested on his laurels or successes from both an individual and team perspective. He as a player, as an athlete has always been motivated and driven to improve. To improve his game, every aspect of it, be it his running game, passing, kicking, game management, which in turn, assisted to improve the players around him. Cronk unlike other players or people for that matter, is a man who has always been a little different. A little unique or as his former halves partner Brett Finch labeled him, a whole lot “weird”. Cooper has always marched to the beat of his own drum. Someone who keeps is cards close to his chest, who doesn’t share too much of himself, even to those closest to him. A guy who before pre-season training or during the Christmas break would take himself off to Arizona in the United States to embark upon an altitude training camp, in order to take his fitness levels to a whole new echelon, in order to make himself a better player. Unheard of. The Storm pre-season already has a reputation of being the hardest there is. Maybe Brett Finch was onto something? A bloke who would remain behind hours after training had finished to fine tune his passing game; perfecting his kicking game, practicing field goals; all facets of halfback play from all different points on the field. Training himself, preparing for any situation, any scenario, ensuring that in moments of pressure, muscle memory coupled with his pedantic yet, flawless groundwork ensured he would be ready to deliver if and when required. As he has done time and time again for the Storm, the Maroons and the Kangaroos. His will and determination to constantly evolve and improve is the one of the major reasons why the Storm have had so much success earning the representative halfback two Dally M Medals (2013 and 2016), a Clive Churchill Medal for best on Ground in the 2012 Grand Final and a Golden Boot – an award handed down by the Rugby League International Federation, for the best player on the planet. Not bad for a guy from the southern suburbs of Brisbane, who landed in Melbourne, signed by the Storm with the club not knowing his best position or who had ever played halfback before, even as a junior running around for the South Acacia Ridge Magpies and St. Lawrence’s College. Cronk is an example not only to every young footballer or every athlete aspiring for greatness, but he is an example of where hard work can take you. The same work ethic that his now former Club Coach lives by. A mantra of “the harder I worked, the luckier I got”. Cooper Cronk has a reputation of being O.C.D., meticulous and methodical in his approach to his football and his life in general. My favourite Cooper Cronk story which sums him up in a nutshell was he was extremely late home from school one day which had his family worried who contacted the police about their missing son. It turns out, on his way home from school, he would pass a rugby league field and kick 10 field goals straight before picking up his school bag and proceeding home. However, one afternoon, he was not striking the ball all too well. So much so, that he refused to go home until he had kicked ten field goals in a row. Forever the perfectionist. That attitude has never faded and still to this day is evident in all the he does in regards to his preparation, performance and recovery. A clean skin both on and off the field, a neat freak and it shows. The way he carries himself, the man oozes professionalism. He is intelligent and articulate; well spoken and presented; has also proven to be quite the analyst with Fox Sports hiring him to analyse games. In many ways Cronk should probably be the face of the game. He has become a mentor to every younger player and kid coming through the ranks at the Storm, taking them under his wing, passing on his wisdom, life experience and what he has attributed to his success and longevity at Melbourne and in rugby league. As young 19-year-old rookie centre, Curtis Scott put it “it’s like I’m talking to Dr Phil”. Not only is Cronk a poster boy for every young footballer in the game, he is a role model for every person, every man or woman that desires change; change for the better. Whilst his well publicised lifestyle is well documented – someone who guzzles a carton of coconut water instead of an alcoholic beverage; who refuses to eat anything out of a cardboard box, opting for fresh organic produce, avoiding fast food, sugar and so on. Whilst not for everyone, his discipline, will power and mental aptitude are traits that are admirable; qualities and behaviours that set a standard for many wanting to make a positive change and can do so. Maybe not to his extreme, but it shows that the onus is upon the individual to make those changes that they desire. I lost a best friend to brain cancer at the age of 27. We all grieve and deal with loss in our own certain ways. I found consolation in Cronk’s lifestyle and holistic outlook on health, wellness and well-being. Whilst I had always venerated and respected his sporting ability and accomplishments on the field, it was his lifestyle away from the rugby league field that assisted me to make changes and place much more of an emphasis on preserving, improving my health, lowering my risk factors to certain illnesses and diseases and ensure that when father time eventually catches up, I’ll be in reasonable shape to tackle impending challenges that life throws up with age. I took solace and drew a lot of inspiration in his life off the field and how that was making him better on it. But I digress…. Whilst I am certainly no athlete, I am sure that Cronk has had a similar impact on many others like myself be it health or another facet of their life. What you see is what you get with Cooper Cronk. He practices what he preaches and that is what resonates with so many people. It is not just words. It’s actions. Many in this world could learn a thing or too about being transparent, accountable and respecting yourself and others, doing away with the narcissistic, conceited, self-absorbed behaviour that many exhibit on a daily basis and surrounds us (Generation ‘selfie’ as i often refer to them as). Cronk is a sportsperson and a individual who always has and continues to not seek attention, popularity and approval of others. He is also someone who is forever side stepping the limelight, instead heaping praise on others. Admirable qualities that many should indulge in for a change. It is quite fair to say that I am quite brazen and forward in my love and affection for the man that is Cooper Cronk. The shock and disappointment that he won’t be at Melbourne Storm in 2018 still hurts. That he will no longer combine to put on a trademark inside, outside, inside set piece with Smith and Slater; their combinations and trick shots that every rugby league fan has learned to appreciate. That there is a real possibility that he may pull on another club’s colours. Selfishly, I had hoped Cronk would retire and transition into business, media and specialised coaching. The 2017 Grand Final was his final game for the Storm. The football God’s were kind and fairytale came true although Cronk was on the front foot with a post game interview stating “there’s no such thing as fairytales in Rugby League, all there is, is hard work and you hope that hard work pays off with a result like this” – it would be the perfect way to draw curtains on a magnificent 323 First Grade NRL Game career for the one club. 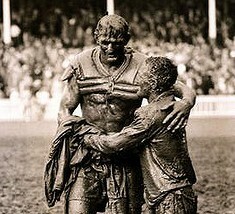 One thing rugby league lacks in modern times, is romance. To see Cooper finish his illustrious rugby league football career in purple would have been about as romantic as one could get. But it was not to be. Many are now debating if his brilliance will be replicated at the Roosters in 2018. Out of the Melbourne Storm system; a system he helped create and establish over a 14-year period. Will he be able to be afforded the same opportunity to play on the front foot as he did in Melbourne, where forward packs made his job as a halfback smooth more often than not. Will he be the same player without the direct message from his mentor Craig Bellamy? A coach who does not mince his words as opposed to a more contentious Robinson. Will he be the same player without his other two-third’s alongside him? This remains a hotly contested argument between fans and media commentators alike – that it has been the brilliance of Slater and Smith that has made Cronk the player he is. Whilst Tedesco is an amazing talent and Friend is an honest toiler who’s service and control from dummy-half are modest at best, both are no where in the league of his two former Storm team mates. If the Roosters flounder in 2018, you can bet your bottom dollar, the pressure will be enormous on Chairman Nick Politis, Coach Trent Robinson and Cronk himself. Cronk thrives on pressure, relishes it even – it somewhat heightens his senses and contributes to his performance. But this pressure may be unlike he has never encountered before; pressure that may put a dent in the player’s legacy. After fracturing a playing group by seeing a 28-year old Mitchell Pearce, an Origin representative, Premiership winning, 10-year club veteran move on in order to bring Cronk to Bondi, Roosters fans will be wondering what was the point of the ‘band-aid solution’ or quick fix signing a 34 going on 35 year old halfback ‘if’ they go backwards or fail to lift the Premiership Cup aloft next October when they had a younger halves pairing that would be around for much longer. You can bet the arguments that have been bandied around above will come to the fore. The Roosters have attempted to replicate the Sonny Bill Williams scenario which helped deliver them the 2013 Premiership. There’s just one problem. Cronk is no SBW and from looking at their roster, the halfback position was not the area of their list that needed most attention. Quite the contrary. It is their middle which is of most concern. Roosters lack genuine size upfront. Most premiership contenders and top 4 teams are blseesed with a formidable 4 prop or middle-third rotation. The ability to lay a platform with your two big men and have the ability to substitute them with two bigger men to maintain the momentum and dominance in the ruck. The stuff halfback’s dream of playing behind. No No.7, no matter how good they are, cannot perform or dominate if the pack is not going forward. Cronk benefited from the size and power of the Storm pack and bench. The Roosters showing in 2017 when up against bigger sides struggled – their preliminary final against the Cowboys was the perfect example of this. Yet somehow it ended up being Mitchell Pearce’s fault. Will it be Cronk’s fault if history repeats itself in 2018? And as his self proclaimed No.1 fan, I was more than at peace with him finishing up, legacy in tact and would have been forever thankful and appreciative for the moments and memories he gave to me and every other Storm and rugby league fan. What I am not at peace with is him in another club’s colours. Just like Walter, Langer, Lockyer wearing another club jersey other than a Broncos one. Sterling, Price, Hindmarsh being seen in anything except Blue and Gold. Ettinghusen, Gallen not in the Black, White and Blue of Cronulla and so on. It just would not only look right, it doesn’t feel right from a fans perspective. One club players are held in a different esteem compared to their counterparts. One club players exemplify and portray fidelity, devotion and loyalty. Cronk albeit his 17 year association with Melbourne Storm, can no longer be seen in this light. Which to me is disappointing and he will no longer be known as just an out and out ‘Storm legend’ like his now former teammates in Slater and Smith. I was on hand at ANZ Stadium to witness history, saw the Storm win their third premiership in their 20 years of existence; saw what was and is the final time, three of the greatest players that have ever laced on a boot play together at club level; and saw the final chapter close on the Cooper Cronk story at Melbourne. Without knowing it, I was also in attendance for the Rugby League World Cup 2017 Final which we now was Cronk’s last ever representative game, equaling rugby league Immortal, the little maser, the late Clive Churchill with 38 Tests for Australia, third highest tests in Australian Rugby League Test history, equally another legendary half who has also called time on his rep career in Johnathan Thurston. Cronk sits behind Darren Lockyer and incumbent captain and record holder, Cameron Smith. It has been an immaculate journey, mirroring an immaculate human being, with an immaculate career that was thoroughly deserving of an immaculate finale. Goodbye Cooper. The happiness, good times, countless smiles, tears and cheers will be forever remembered. Time goes by, but memories last a lifetime. I have plenty (including being the owner of his 2017 Premiership winning game worn jersey – don’t ask me how much, but I will say, one can certainly live a full healthy life with one kidney). But from 2018, Cooper, you are the enemy. Consider my unwavering affection, a thing of the past – just like your Storm career now is. Cronk’s move to the Sydney Roosters confirms something. Regardless if it is 14 years or 14 minutes, players are only ever on loan to the fans. Our emotional attachment, investment and sense of ownership of players at a club is fraught with heartbreak and disappointment. Just look at the modern day horse trading that has seen Moses Mbye end up at Wests, Aaron Woods in his first season at Canterbury, now calls Cronulla home and I’m sure there will be more mid-season swaps before the clock strikes 12.00am after June 30. Which brings it all back – that there is no one, no player is bigger than the club. Whilst it is easier said than done, I’ll be endeavouring to not get too hung up on any player at the Storm now or in future years like I did with one Cooper Patrick Cronk. Another day at Concord, another coach is sacked. Wests Tigers, the Joint Venture NRL Club has terminated the services of its Head Coach, Jason Taylor, effective immediately. Taylor’s dismissal by the Concord based franchise means that Wests have now had 3 coaches in 5 years. The terms stability, professional are not ones that should be associated with the organisation. Since their maiden premiership in 2005, the entity has also churned through 5 Chief Executive Officers. Jason Taylor, a former First Grade halfback, a diminutive No.7 who amassed over 2000 points and well over 200 NRL games across Western Suburbs, North Sydney and Parramatta started his coaching career at the Eels. Taking over from Brian Smith, after sitting 15th, Taylor look the Blue and Golds to the finals series and handed one Jarryd Hayne his NRL debut, one of his first decisions when picking up the clipboard at O’Connell Street. Wanted by the playing group yet unwanted by the former Emperor of the Eels, Denis Fitzgerald hired Michael Hagan for the 2007 season. Taylor then was given opportunity by South Sydney after parting ways with Paul Langmack. Taylor took the Rabbitohs to the Finals, the first time since 1989. His tenure whilst a successful one was unceremoniously ended through an off field incident being assaulted by one of his players on a Mad Monday function. Taylor took ownership of the stuff up, admitting it was wrong for him to be on the drink with his players. Lesson learned. As most in society will attest too, nothing good happens after 2.00am with alcohol. A decision that he regretted and probably still regrets to this very day. Taylor was given a lifeline by the Sydney Roosters, taking the reigns of Easts NYC U20’s side before Head Coach brought Taylor in as an Assistant Coach, charged with the responsibility of the Roosters attack. Robinson a premiership coach in his first year at the helm of the Bondi based club, credited Jason Taylor for the side’s attack, saying he was instrumental in refining its attacking sequences, pieces and structures. Whilst at Concord, movement was a foot yet again with Wests Tigers deciding not to provide an extension of former Coach Mick Potter, who was embroiled with a stand off with former club captain Robbie Farah after Farah said he “couldn’t coach”. The Tigers are now looking for a new Head Coach to take the club forward into the future. Just as Mick Potter and Jason Taylor were supposedly hired to do. So who’s the next sucker? Which current Coach, be it one that is currently without a coaching gig in the NRL or ambitious Assistants want to take on Mission Impossible; and I’m not talking about taking Wests Tigers to the finals and ultimately a second Premiership. No folks, I’m referring to surviving what is a toxic, volatile playing group that is in control of the football club and has done for far too long. Player power saw veteran Coach Tim Sheens tenure end at the end of 2012. Player power saw Mick Potter also lose his gig ending any possible extension beyond 2014. And now, player power has also ended Jason Taylor’s occupancy in the hot seat in the lower tier of Concord Oval’s western grandstand. Wests Tigers is a club that governed by personality, driven by egomaniacs, a culture, an environment that has been allowed to fester due to one key factor. A severe lack of credible and strong leadership in the front office. Governance was an issue that was highlighted by the NRL and ARL Commission when the game’s governing body had to financially assist the Joint Venture Club when the Balmain side became insolvent and unable to financially contribute as apart of the original shareholders agreement formed back on 27th July 1999. Despite not being able to financially contribute long before the 2014, the time the NRL had to step in, they still had representation, a voice and shared the Chairmanship of the Club, decision making which has ultimately led to this specific point in time. Decisions to sack two previous coaches before Taylor received his marching orders. Decisions to kill off and end the life span of both foundation clubs in the second tier level (Reserve Grade) NSWRL Intrust Super State Cup competition, where fellow pioneers from 1908 including North Sydney and Newtown still have a representation. Decisions to continue to neglect a growth region in the South-West of Sydney, a population of half a million people, a stadium that hasn’t had a full-time rugby league presence since 29th August 1999 when the Magpies last flew. Decisions to allow players to be paid overs, well over what their market value was, decisions that led to the club’s salary cap become an absolute mess which equates to Jason Taylor having very little autonomy in being able to build and formulate the playing list, the squad, the team he should have been allowed to have. Decisions that enabled the club’s four biggest names coming off contract at the same time which has inevitably seen the quartette hold the club to ransom, ending Taylor’s tenure and I’d dare say coaching career in the NRL. Contray to reports, Jason Taylor isn’t and was never the issue at Wests. Just like Potter or Sheens were not the issue. Sheens put it bluntly a couple of years back when asked why his services were terminated by the Joint Venture club. The Australian Kangaroos coach at the time on Fox Sports’ magazine show NRL360 put it bluntley “Players sack coaches” and left it as that. Read into that what you will. Fast forward to 2013. Farah comes out and tells the world “Mick Potter can’t coach” that virtually spelled the end of his tenure at the club. The point being that it does not matter if Jesus Christ was coaching Wests Tigers, whilst the power resides with the players who dictate what happens at Concord, no coach will be able to enforce change. Turning water into wine and arising Lazarus from the dead would be a much easier task than coaching at Wests. Have a look at the Tigers list. Since Taylor arrived, he has improved Wests position on the ladder each year, remembering they missed the finals by 1 point last year. 1 point – then you consider how many games Simona’s actions had an influence in games they lost by narrow margins in 2016. Who’s to say the club doesn’t go on to make the Finals and Taylor’s job is safe and sound? Whilst it’s a hypothetical, it could have certainly has influence, shoring up his future well before the kick off to this season, where the playing group would have known well in advance who the coach would be beyond 2017. No other coach would have been able to get the Wests Tigers any higher or performing better. Sometimes there’s no more juice in the lemon to be squeezed. Again, this ultimately comes back down to incompetent administration and a playing group that has the power and control of the organisation. That in it self is a recipe for disaster. Chair of the Wests Tigers and CEO fronted a media conference at Wests Ashfield Leagues club yesterday citing that the decision was purely ‘performance related’, almost to save face and send a message that “we’re in control” that the administration of the entity is calling the shots. Stevie Wonder can see that is so far off the mark, it’s not funny. The sad thing is, the vision impaired musical genius and Wests Tigers Chair Marina Go have something frighteningly in common. They both have absolutely no Rugby League nous; no concept, no grasp, no understanding of the fabric of the Game. Her performance in addressing Taylor’s dismissal clearly highlights this yet again. Just as she and her co-horts on the Wests Tigers board hired Taylor for the purpose of enforcing generational change at the club and fixing the club’s ailing salary cap woe’s. It wasn’t Taylor that sacked Farah and denied him his 250th Game for Wests Tigers, it was the board. The board loaded the gun and merely made Taylor pull the trigger. Taylor since day dot in 2015 has been hung out to dry by the utter incompetence that is Wests Tigers Board and Management. He is the scapegoat for a sporting organisation; an NRL licensed franchise that wouldn’t know its arse from its elbow. The key element in all off this fall out is Leadership, or lack there of it. Something Wests do not have and wouldn’t know it if they were to walk down the street and tripped over it. Leadership would have ensured Taylor as Coach was given the full support, reigns and autonomy to run his own race, steer the ship and set the course for the football side. Leadership would have seen player power and control extinguished, ensuring the ego’s and self-aggrandizers would have been shown the door. Former Premiership winning coach at Eastern Suburbs and Parramatta, the late Jack Gibson coined a phrase that is still relevant today, that “winning starts in the front office”. He additionally said that “Coaches make the best recruiters”. The Tigers Board and Administration as a whole is shambolic. The left hand doesn’t know what the right hand is doing. The Coach, now former Coach was not allowed to build and establish the roster he so desperately wanted, instead inherited a list and a salary cap mess due to sins of the past. That in essence sums up Wests Tigers in a nutshell. For all those coaches that are being head hunted and linked to the now vacant post at Camp Concord, whilst the opportunity to coach in the NRL is extremely scarce, those that did not come down in the last shower would be steering clear of this potential job opportunity for a plethora of reasons as performance and Jason Taylor’s coaching ability is purely a smokescreen, a concealment of something much more dire that is not visible from the outside looking in. Be it Ivan Cleary, be it Todd Payten or any other potential candidate who’s name is yet to be tossed up by the media, it is crucially important to ensure what they are getting themselves into; if it is the ‘right fit’. Is the next coach willing to be subjected to dealing with hierarchical structure that wets the bed and shoots from the hip when players and their managers threaten to re-commit their futures beyond their current season? Is the next coach prepared for a playing group to stop listening to their philosophy and voice, turning against the new mentor, citing change because they no longer ‘like’ the coach? In every other workplace, in every other industry, managers and employees aren’t expected to be best buddies, but at the very least, fulfil their duties and obligations in a professional manner. This unfortunately is not the case at Wests and it’s been this way for far too long. I was utterly dismayed, yet not overly surprised at some of the fan reaction, celebrating to dismissal of Jason Taylor. Something that many Wests Tigers fans and members have no idea about. For those irate and disgruntled supporters that are rejoicing at the fact that Taylor is no longer at the helm, do not let your emotional attachment distort your view like the sun does to ones eyesight on the Leichhardt Oval Hill. Taylor was merely made out to be the perpetrator, whilst the real architects of the continuous mismanagement of the entity, the Farah debacle and failings of the NRL side, are the same individuals setting the strategy and vision for the future of your club. Sacking the coach isn’t going to solve the malignant problems plaguing this basket case of a rugby league club. If the club’s leaders (and I use that term loosely) allow and listen to the players to have a say in the appointment of the next coach, they would have learnt nothing out of this entire, shameful experience which really is, a line in the sand moment for the 18 year old football club. One thing is clear, rugby league and professional sport is a cut throat business. Yes, it is driven by performance, driven by results. It is a results based industry. One lives by and dies by the sword, a metaphor for success. It is also an industry that does not treat people very well. The Game and in particular rugby league clubs have a long history of chewing up good people and spitting them out without hesitation or consideration of their livelihood. Taylor will most likely never coach in the NRL ever again as a result of being knifed by the supposed people that initially supported him and hired him to make hard decisions and bring about change. The same should apply to board and management who fail to deliver. Accountability. Something that does not seem to be present at Wests Tigers. If it was, Taylor would have been joined by a few others yesterday as he walked the Green Mile, down the long corridors of Concord Oval. About 18 months ago, the fledging, embattled Gold Coast Titans franchise were treading water. Financially, they were a club in ruins with next to no revenue coming in and were haemorrhaging expenditure. So dire the situation was, the NRL had to step in as the club went into administration with the game’s governing body taking full control of the business; just as the Game did with Newcastle and to a lesser extent St George Illawarra and Wests. The Titans were damaged goods, a tarnished brand, a commercial disaster. No prospective investor nor off contract player would dare even contemplate going near the joint. It would have be horrible business sense and career suicide for any athlete. The chorus rang strong from many within the rugby league fraternity that the Titans were doomed. Yet another failure, after subsequent franchises before them had also been (Giants, Seagulls, Gladiators and Chargers) that Rugby League would never work, never prosper, never survive on the glamour strip of South-East Queensland. Many were starting to think and buy into this line of thinking and mentality, that the Game would be better off investing in a new market then persisting with a football club in a region that has had three decades of failure. Prospective Central Queensland NRL Bid consortium even suggested of taking over the club and sharing Home Games between Mackay and Robina. Even the Central Coast Bears expressed an interest in a partnership. I have been one of a few who has been a strong advocate for persisting with a NRL presence on the Gold Coast as written previously https://dwatsonhayes.wordpress.com/2015/03/01/why-rugbyleague-needs-and-owes-the-gold-coast-gctitans-thrunthru-nrl-iwillneverwalkaway-titans/ The Gold Coast is a vital cog in the NRL’s long term vision and strategy of having a national footprint right across Australia. The Gold Coast shores up a Rugby League presence right along the east coast, stretching from Townsville right down to Melbourne. To walk away from that would give Rugby League’s opponents a free kick at the region’s population (the largest growth area in Australia) and 7,000 plus juniors who are aspiring to be Titans. But 12 months on, the dark, bleak and uncertain times are all but over. Brighter days are not only ahead but are already as visible as a sunrise on Surfers Paradise beach. The Titans have re-built from the bottom up through sheer blood, sweat and tears. Respective channels and levers of revenue are up. Gate receipts have doubled compared to 2015. Membership has increased tenfold. Commercially, their jersey and kit is worth millions of dollars. The Gold Coast strip is full of sponsors, a sign that the organisation is once again an attractive commodity that companies are happy to align their brand and business with. With space in their cap and money to throw at a star, the Titans went all out to sign Manly pivot Daly Cherry-Evans in 2015. After a farcical chain of events, months of rumour and innuendo brought on about through a ridiculous ‘cooling off period’ which enabled players to renege on a contract signed in good faith (apparently) DCE played the Titans to bump up his asking price at Manly and the Sea Eagles offer trumped the Gold Coast. $10 Million for 10 years. The negative for the Titans was that they had made recruitment decisions to both retain players and let go personnel on the prized signature of Cherry-Evans. His backflip sent the Titans into further disarray. Not only would DCE bring on-field expertise and leadership, he is a high profiled athlete in the NRL, who would have created a flow on effect of attracting other players to the franchise and increased the off field opportunities for greater fanfare and support as well as attracting new sponsors to get on board with the Gold Coast. Back to square one and no real light at the end of what was becoming an incredibly long tunnel. Whilst the front office was now in order, the football department was a different story. Coach Neil Henry left to pull together a team with virtually no stars, no big name attractions, no strike weapons. To make matters worse, a contract bungle saw live-wire centre James Roberts walk out and sign with big brother the Broncos. The Titans on paper lack the quality of a playing roster like their top 4, top 8 counterparts are blessed with. Until the 3rd August 2016. This date will forever be significant in the Titans history as a Rugby League Club. Having faired better than pundits and so called experts had them travelling in Season 2016, many had the Gold Coast sitting at the bottom of the ladder, odds on favourites to collect the dreaded wooden spoon. But credit to Coach ‘King’ Henry and his young group of misfits, discards and has beens who currently reside in the Top 8 after 21 Rounds of the Telstra Premiership. Performing and matching it with the best with their roster has been an outstanding effort with many predicting big things for a lot of the young guns that Neil Henry has been forced to throw a jersey at because of injuries and an inability to recruit big name players. But are they a legitimate Premiership contender? A threat to the likes of competition leaders Cronulla or reigning Premiers Nth QLD Cowboys? 4 days ago you would put the house on the Gold Coast being next to no chance of appearing on Grand Final Day or even scrapping into the Finals. But anyone who has a vested interest in the Game will tell you, a week is a very long time in Rugby League. So much so, no one could have predicted what was about to unfold and take place that will no doubt change the Titans course of history forever. With corporate support, a membership base growing week by week, a bunch of kids making a name for themselves in one of most competitive and largest sports in the southern hemisphere, a new training and administration base close to completion, what could be the final piece of the puzzle for the Gold Coast? Enter one amazing athlete. A name, a player, a brand that is recognised on the world stage. A freakish talent that has proven he is more than a Rugby League player, he is a certified enigma who defied the odds of making it in a foreign country, in a complex foreign sport. Jarryd Hayne. The larger than life, somewhat arrogant, yet amazingly gifted specimen jetted into the Gold Coast to become the Titans latest signing after mid-ear acquisitions in former NZ Warriors outside back Konrad Hurrell and Hayne’s former Eels teammate Nathan Peats after Parramatta was forced to release the feisty No.9 due to their Salary Cap breaches. This was a signing that no one saw coming. Not even the ardent Titans fans would have ever have imagined or envisaged the Gold Coast announcing a player of the calibre of Jarryd Hayne. The Rugby League world went into shock. Fans were stunned. Social media went into meltdown. Parramatta Eels supporters were and still are filled with rage and disappointment, whilst Gold Coast fans cannot believe their luck that their club, the same club that was on its knees, looking at being wound up and relocated, had now a Test, Origin and NFL athlete on its books. Surreal would be just one superlative Titans fans would be using to describe this amazing coup for the once struggling franchise. I would imagine many are still pinching themselves at the thought of Hayne running out at CBUS Super Stadium at Robina. The fans, the members, the community, the entire Gold Coast region needed something. After the administrative woes and uncertainty of their future, an off field drug scandal brewing, the lack of on field success, a rising star walking out and the final kick in the guts with DCE turning his back on the club, Titans fans and Rugby League supporters on the Coast must of been thinking when would the hits stop coming? One disaster after another. “What next?” many would have been thinking. “When are we going to get a break? A slice of luck?” Whoever doubted that the Rugby League God’s do not exist, better think again. Enter Jarryd Hayne. Not only will Hayne bring x-factor and attacking prowess making the Titans even more competitive than what they have already proven to be in Season 2016, Hayne will bring star power off the field. In the past 3 days alone, Hayne has reportedly generated $100,000 across ticket sales, memberships and merchandise and he’s yet to play a game. Only star’s have the sort of impact. His appeal is infectious. A natural athlete with an abundance of raw talent, Hayne not only is the sort of player that makes fans sit on the end of their chairs and progress to their feet with every run, every touch of the ball, his confident ego, his swagger makes him the perfect billboard for businesses to have him endorsing their respective goods and services. (More than an athlete. Hayne announcing his contract with the 49ers NFL Franchise. Hayne is not just an extraordinary athlete. He has transformed himself into a brand. An international brand at that. A brand that commands interest, both from the media and business who watch his every move, wait on his every word, hoping he can help fill the news cycle and align himself with companies, helping to endorse and promote products or services. He is much smarter than he looks. In a short space of time, Hayne has proven to be a lateral thinker, an individual who sees the bigger picture and life outside the sporting bubble. He is trend setter in many ways. A cunning businessman in boots if you like. Hayne marches to the beat of his own drum. Gordon Tallis, now a Titans Ambassador, has labelled the signing of Jarryd Hayne bigger than the prize signing of Wally ‘The King’ Lewis by the Gold Coast back in 1992. Lewis, one of the game’s 8 immortals, a Queensland and Australian Rugby League legend was a major coup for the Seagulls (previous Gold Coast franchise 1990-95). Hayne certainly does trump Lewis’ signature for an array of reasons. His journey over the past 2 years has been one of amazing feats and achievements. His ability to risk it all, walk away from his comfort zone, adapt and make the cut in a foreign sport was a fairytale, resulting in his popularity, name and brand become well renowned both domestically and abroad. That brings massive attention, collateral and interest, especially financially which will go an incredibly long way and assisting the Gold Coast club achieve success and sustainability as a sporting organisation. But also from a development perspective. Not only will every young Titans fan in Nerang, Robina, Burleigh, Mermaid Beach, Southport, Helensvale be wanting a new Gold Coast Jersey with the #1 on the back, every young junior sports person on the coast will be practicing the ‘Hayne Plane’ in the school playground, in the backyard, in the lounge room, at training and on the sports field. Kids will choose to pick up a Steeden over a Sherrin. Jarryd Hayne signing with the Titans fires a shot across the bow to hometown rivals the AFL’s Gold Coast Suns, who’s prized signing Garry Ablett Jr. has not lived up to the hype or taken the Suns to any level of success since their inception. In a war of the codes to win the hearts and minds of the people of the Gold Coast, the Titans have struck back, in monumental fashion. The Titans are assembling a roster for not only now, but for the future. Hayne will undoubtedly prove to be a drawcard for off contract players and will also help Coach Neil Henry to retain emerging stars in the likes of young Half Ashley Taylor who is line to take out the Dally M Rookie of the Year Award. Taylor has the makings of being a certified superstar. One thing is for certain. Long suffering Gold Coast Rugby League fans finally have a team and a club they can be proud of. Mainly due to the efforts of Titans CEO Graham Annesley, Chair Rebecca Frizelle and the Titans Management team, coupled by the revamp of the football department by Neil Henry, an astute tactical coach with a reputation for turning around teams and taking sides to finals football during his tenures at the Raiders and in more recent times the Cowboys. Things are coming together for the Gold Coast franchise AND it’s about time. Strong governance, professionals in key positions, the Titans brand is no longer seen as an eyesore in a saturated sporting market, competing for the almighty dollar. Hayne’s acquisition may be the catalyst to ensuring their long-term future and existence in the National Rugby League, in the South-East corridor of Queensland. Rugby League on the Gold Coast is imperative and now, it is certainly here to stay. Hayne’s return is also a positive for the NRL. Too often, the game has seen its stars flee the code for more lucrative opportunities namely in rival code Rugby Union. To have someone of the calibre of Jarryd Hayne who has succeeded in another sport, in another country that made headlines right around the world, is a major PR win for Rugby League. It proves the strength of the sport and the strength of the National Rugby League competition on the world stage. Love him or loathe him, he is an attraction. Whilst Titans fans will rejoice at his arrival, rival club fans will be wanting to see him play. Just as opposition fans love to watch the game’s elite. The Thurston’s, the Smith’s, the Inglis’. I for one welcome Hayne’s return. You can put the house on one thing, next season’s clash between the Titans and Eels will have extra significance. The Rugby League International Federation (RLIF), ARL Commission and NRL dropped the ball with Semi Radradra back in May. Instead of making Radradra a Fijian NRL Ambassador, they allowed the Fijian born native to switch his allegiance to Australia which was fuelled by an additional cash grab which made the international product and eligibility a farce. With Hayne returning to the NRL after failing in his bid to play for Fiji in Rugby Sevens at the Rio Olympics, instead of rolling out the red carpet and giving him a walk up start in the Australian Kangaroos test team for the Four Nations and next year’s Rugby League World Cup (RLWC2017) why not make him the NRL ambassador for the Fijian Bati Rugby League Team. Inspiring and encouraging young Fijian players playing in the NRL, U20’s and Second Tier competitions, to pledge their loyalty and international allegiance to the emerging nation of the South Pacific, not to mention, motivate Fijian athletes to pick up a Steeden instead of a Gilbert back in the Island Country. Hayne could be the face of Fijian Rugby League. Fiji were semi finalists in the 2013 World Cup, falling one game short of the Final, coincidently against Australia, a side Hayne was apart of that went on to defeat New Zealand and be crowned World Champions. Hayne last pulled on the Fijian Bati jersey in the 2008 World Cup lighting up the field with his devastating athleticism. Making him a NRL Ambassador for Fiji, giving him the captaincy would be the perfect tonic for the international game and only strengthen the game globally, ensuring the best athletes are not being siphoned by the top three superpowers of international rugby league. A Fiji team led by Hayne, encompassing players like Kevin and Wes Naiqama, Kane Evans, the Sims brothers (Korbin, Tariq, Ashton) and emerging talent like Melbourne Storm flyer Suil Vunivalu the list goes on. There’s no doubting the vast talent at Fiji’s disposal, although having a leader like Hayne leading their assault would be enriching for Fiji as a nation and Rugby League in the country. Current Fijian Bati Rugby League coach and Assistant Coach of the Newcastle Knights, Mick Potter is already keen to have Jarryd Hayne pulling on the Black and White of Fiji.”I’d be over the moon if he selected Fiji because that’s where his roots are based and he wants to contribute. That would be fantastic for Fijian rugby league, to have a man of his calibre available” Potter said back in May. I for one can only hope it comes to fruition. Let’s hope the ARL Commission and the Rugby League International Federation see the ‘bigger picture’. International Rugby League is in complete and utter disarray after the Semi Radradra defection from his native Fiji to Australia has once again brought the eligibility farce into the spotlight. After the recent success and momentum of expanding the tri-nations to Four Nations and the 2008 and 2013 World Cup’s attainment, the international game was starting to make some serious headway and inroads of no longer being a mediocre, laughing stock compared to its counterparts on the world stage; namely in Football and Rugby Union. Whilst Australia, New Zealand and England have always been the dominant nations that have prevailed over 100 years international rugby league has been played, the emergence of minnow nations, namely in the pacific in recent times has actually seen that a little bit of fostering and development is starting to pay off, making countries outside of the big 3, somewhat competitive. In 2013, Fiji fell one game short of making the Rugby League World Cup Final. In 2014, Samoa had won the Pacific Cup to be the fourth nation to compete in the Four Nations. In 2016, it will be Scotland after winning the European Cup last year. A lot of the success has been put down to the fact that players in the NRL and English Super League with heritage or bloodlines to a certain country has seen players turnout and represent these minnow nations. The likes of Cowboys Fullback Lachlan Coote, Panthers halfback Peter Wallace and former Wests Tigers prop, now Leeds enforcer Keith Galloway will represent Scotland in the upcoming Four Nations tournament later this year. This is turn not only strengthens Scotland and making them more competitive, it raises the profile of the sport, of the game in Scotland as a whole. That can only be good for International Rugby League. Yet there is cause for concern, which has the potential to halt progress and prosperity of the international game. That being international rugby league eligibility. As it stands, the eligibility to represent ones country or country they wish to represent is down to a specified criteria. That being, born in the country you wish to represent or living in the country for a minimum of 3 years and becoming a citizen of the land. The latter is what Semi Radradra has done and as such applied to change his eligibility from his native country of Fiji to Australia, which has opened up a Pandora’s box. Many fans have been left scratching their head as to why Radradra would turn his back on Fiji in order to pull on the Green and Gold of the Kangaroos. From a personal view point, Radradra wants to challenge himself and secondly, the remuneration is too good to refuse. At present, Australia, New Zealand and England are the only countries in International Rugby League that handsomely reward their players for playing test football. Australian players are paid $20,000 for pulling on the jersey. There lies the motivation for players like Radradra to switch allegiances. And good luck to him. I don’t think anyone begrudges a player being able to earn what they can if the rules and regulations allow it. Whilst the eligibility remains as it is, you will start to see more scenarios and cases similar to that of Radradra’s, which is a red flag for the continued development of fledging minnow nations who’s goal is to become more competitive and stronger on the international stage. This will certainty not be the case if players like Radradra are turning their back to chase the coin that is on offer, as opposed to the pittance that minnow nations provide to their international test representatives. It is one thing to say that earning a national test jersey, to play for ones country should be an honour, a privilege and something that is earned. Having remuneration benefits has perhaps in some small way cheapened the jersey, the accolade of playing for your country. Whilst its still a highlight to the players, there is a different motivation to play representative football, to when there was 10 to 20 years ago. We can thank the globalization of the commercial dollar penetrating sport for that. The governing body and its affiliates has the power and capacity to change eligibility if they so wish too. However, the silence has been deafening from the Rugby League International Federation (RLIF) and the Australian Rugby League Commission (ARLC). Nothing has been said, not a peep. What isn’t helping International Rugby League’s ability to grow is the ridiculous ‘veto’ that exists when a player elects to change their eligibility from one country to another. For example, Semi Radradra ‘if’ overlooked by Australia for the four nations or world cup in 2017, even though he has made himself available, he is unable to go back and play for Fiji for 2 years. This applies to all players, from all nations. How does this help strengthen emerging nations? New Australian Kangaroos Coach Mal Meninga who recently announced his first Australian test team is on record saying he is “passionate about the game of rugby league” and wants to see the international game “become a force”. Yet Meninga, instead of having the kahunas to overlook Radradra or come out and display some much needed leadership pleading with the RLIF to change its eligibility laws, did neither. How does making Australia, ranked No.2 nation in the World, stronger buy selecting other nations best, help make the international game a force? It does completely the opposite. Meninga has a job to do. That is, to restore pride in the Australian Jersey, to make playing for your country the pinnacle of a players career, rather than representing your state which is the current viewpoint among many and ensuring the No.1 test ranking once again is Australia’s. But isn’t there a great responsibility as one of, if not, the leading Rugby League nation on the planet, to help foster the international game? Helping our pacific neighbours be competitive strong holds rather than the whipping boys in the international arena? Wayne Bennett has recently come out and blocked his Samoan test international 5/8th Anthony Milford from being able to play for Samoa in the upcoming Pacific Test match. As to why he has prohibited his young Broncos playmaker from representing his country of heritage, he simply stated because he can and doesn’t care. This coming from a supposed advocate and supporter of International Rugby League. A man who helped coach the victorious NZ Kiwi’s to their 2008 World Cup triumph and who has recently been appointed as the coach of England. With this sort of attitude coming from within the game, is it any real surprise to see why eligibility is in the mess it finds itself in? Self-interest from coaches, nations and players is why Rugby League will never reach the heights and lofty ambitions of being able to be a competitive, well-supported global player. What is to gain from having three nations dominate for the next 100 years? How does that help boost International Rugby League? Logic tells me, the stronger and more competitive international rugby league becomes, the greater the interest and support will be generated, the greater the broadcast deals, the greater the sponsorship which in turn leads to greater revenue opportunities that pours in for the RLIF to disperse amongst its affiliate and non-affiliate nations to bring development and competition up to where it needs to be, to be taken serious. Logic. Something that is obviously lacking by the RLIF and the ARLC. Even though I am a proud Australian, I am also an advocate for Rugby League to think outside its domestic square and confines. Does the tag of being No.1 in the world or world champions carry much weight when you fended off another two countries for the bestowed honour? Reminds me of American Baseball. No other country plays it in the world on a competitive level that they do domestically, but the winner of each year claims to be World Series Champions. Please. I do not want to see continued and sustained success of the Kangaroos be to the detriment of the growth and prosperity of the international product. I long to see the likes of Samoa, Tonga, Lebanon, Scotland, Ireland, the Cook Islands, PNG et al. be competitive in their own right and one day challenge the likes of Australia, England and New Zealand for a World Cup. I remain hopeful I will see a change in mentality and tact by the RLIF in my lifetime, but I will not hold my breath. If the powerbrokers and respective governing bodies won’t stand up and show leadership about changing International Rugby League for the better, then it is up to the players, as custodians of the sport to stand up and help. The likes of BJ Leilua from the Canberra Raiders and Sydney Roosters prop Kane Evans are already doing their bit by choosing country over City-Country and inevitably Origin and Australian representative honours to help strengthen Samoa and Fiji respectively. It is refreshing to see that the lure of financial reward is not a forgone conclusion to all players who like avid Rugby League fans, can see the bigger picture of making ‘The Greatest Game of All’ truly that, on the world stage, not just domestically. Nervous and uncertain times face the Melbourne Storm in 2016. Whilst critics and pundits again write the southern franchise off, citing that age will again be the factor of their demise along with a lack of notable depth and not being active in the player market as their counterparts have been, that is the least of Melbourne’s worries and concerns. Their major issue and focus is more internal than worrying about views and opinions of the external environment. 2016 is a significant year for the Melbourne Storm and it’s long-term future going forward. In 2012, two years after the infamous salary cap scandal, they defied the odds to win the Premiership. In 2013, the club was released from the grasp of News Corp and sold to a private consortium known as M.S. Holdings Australia Pty Ltd. In 2014, their long-standing captain, Cameron Smith re-sign to become a one-club player. 2015, the game’s greatest fullback also committed himself to joining Smith in certifying his future in Storm colours for life. However, two other prominent Storm figures are yet to decide their long-term future and the decisions of both individuals could have ramifications for the Melbourne NRL franchise. The man known to have created the famous ‘Storm culture’, a coach, a leader, a father figure, a mentor, Craig Bellamy is in the final year of his current contract. Bellamy has a clause in his favour, should he choose to activate it, it will see him remain at the Storm until the end of 2018. But the man responsible for executing Bellmay’s astute game plans and driving the professional Storm culture is also in the final year of his current deal at the Storm. The current Australian, Queenland and Melbourne halfback Cooper Cronk, like Bellamy remains coy on where his future lies beyond 2016. Having not being short of suitors for his services, Cronk has been heavily linked to several Sydney clubs, who would be more than eager to have without question, the best organizing halfback in the world to date. Cooper Cronk is a unique individual. Not one for the limelight, he keeps to himself. Shy’s away from the media and is a cleanskin when it comes to image, reputation and overall persona. He is the model rugby leaguer player that all NRL clubs wish their athletes could be. Well presented, groomed and articulate when talking, a football club would not just be acquiring a star player to their organization, they would be procuring a brand. A brand that would have a positive impact upon key revenue levers like membership, gate receipts and sponsorship. So the $3.5 Million dollar question is, which Sydney NRL franchise is going to spend that kind of loot over 3 years to secure the game’s leading playmaker? Or will the Storm win out in the end? Canterbury-Bankstown have lacked a genuine half since Des Hasler arrived at Belmore in 2012. A pack that rolls down field with ease and a swift, nimble and potent backline, the Bulldogs have lacked a No.7 that could be the final piece of the Premiership puzzle. It was no coincidence that it was Cronk that proved to be the difference in their Grand Final defeat to the Storm in 2012. Rumour and innuendo surrounds the Rabbitohs current halves pairing. Reportedly both Adam Reynolds and Luke Keary, the playmaking duo who helped deliver the South Sydney the 2014 Premiership, breaking a 43 year drought are on the nose with Coach Michael Maguire. Reynolds was denied a release just before the New Year and Keary is in a fight to retain his No.6 jersey after Cody Walker, a former Storm squad member, will start the year in the Halves for the Redfern based club. Could Souths be willing to cut lose their current halves in favour of securing Cronk? If the signing of favourite son Sam Burgess is an example to go off then it would not surprise anyone in the slightest. St George Illawarra reportedly have been heavily interested in securing the Melbourne maestro’s signature, although Dragons coach Paul McGregor hosed down speculation, pouring cold water on the Red V signing the Australian No.7. However, with former halves partner Gareth Widdop at Wollongong and current halfback Benji Marshall yet to receive an offer from the Dragons, speculation will continue to mount, despite McGregor’s adamant admission. With all Queensland NRL Clubs having their halves wrapped up and secured, the only other feasible option for Cooper Cronk is with an organization he is awfully familiar with and has been associated with for 12 years. The Melbourne Storm. Having secured both Billy Slater and Cameron Smith until the end of 2017 and 2018 respectively, the Storm will be hoping that the lure and ambition or remaining a one-club player will be too hard to resist, ensuring that Melbourne are able to have all of the famous ‘Big 3’ finish their careers together with the club that provided them with the opportunity to play First Grade rugby league in the NRL. Cronk is no stranger to contract speculation and gossip. In 2012, he was off contract with the Storm and reportedly a move to the Titans was a done deal. Sign, sealed and delivered to the Gold Coast. The media reports that the incumbent Maroons halfback was keen to relocate back home to be closer to family in Queensland, only for Cronk to present and announce at a press conference at Storm HQ that he was remaining in Melbourne for a further 4 years. This time around, the media hullabaloo is that Cronk is keen to relocate to Sydney to be closer to partner Tara Rushton who resides in the harbor city. One thing is for certain. This will be Cooper Cronk’s final NRL contract. Whilst the halfback is still the incumbent test and Origin No.7, remains at the top of his game and shows no sign of slowing down, mainly due to his professional approach and health orientated lifestyle, the duration of his next deal will still see the best of Cronk’s on field leadership, game play and heroics. Not to mention, continuing to be one of the NRL’s leading ambassadors and role models for kids, adolescents, young men and aspiring footballers. What will continue to drive Cronk for the next several years of his career? What drives every professional athlete. The want and will to win. To win Test matches, to win Origins, to win Premierships. The want to better himself; to improve areas of his game, as no professional is ever satisfied, believing there are always key areas and aspects to their game they can improve upon. The fire still burns in Cooper Cronk’s village. What is somewhat of a rarity in todays modern game, the notion of a being ‘one club player’ is what not only Storm powerbrokers, stakeholders fans and members will be hoping sways heavily on Cronk remaining with Melbourne, but I think all rugby league and sports fans in general would want to see the 275 game veteran finish his career in the purple jersey of the Storm. Just like Lockyer was to the Broncos; Ettinghausen was to the Sharks; Hindmarsh was the Eels, Andrew Johns was to the Knights, Cooper Cronk is and hopefully will continue to be for the Storm. A Rugby League Melbournian for life.